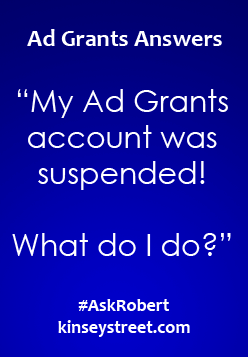 Home » Blog » Was Your Ad Grant Account Suspended on September 9th? On August 16th the Google Ad Grants team sent an email out notifying grantees of recent changes to the Website Policies and Promoting Multiple Sites. This email by the Ad Grants team notified grantees that they can only use a website domain that was approved through the Google for Nonprofits application, the Ad Grants enrollment process, or the Additional Website Domain(s) Request form. If you received this email then your account was identified as one that was serving on a domain that had not been approved and would be suspended on September 8th, 2017, if no changes were made. If your Google Ad Grants account was recently suspended on or around September 9th then it likely has to do with your Ad Grant account being identified as one that was serving on a domain name that was NOT listed as being approved through the Google for Nonprofits application, the Ad Grants enrollment process, or the Additional Domain Request form form. To get your account reactivated, grantees must fill out the Additional Domain Request form and include ALL domains they are advertising on. Domains that are not approved, must be removed from the account before the account can be reactivated.